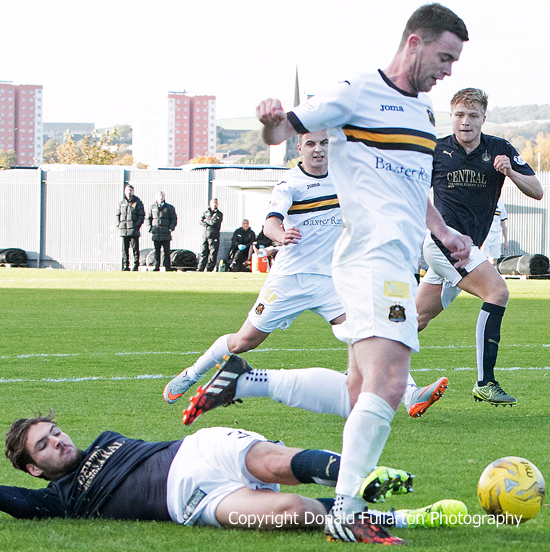 A CROWD of nearly 1,000 at the Cheaper Insurance Direct Stadium saw Dumbarton well beaten by a Falkirk side which dominated throughout. "It was a disaster, and I did not see it coming," said stunned Sons manager Stevie Aitken afterwards. Striker John Baird got the Falkirk show on the road with two well taken carbon-copy goals, rounding keeper Mark Brown on both occasions after blunders by the defence. Then Sons scorned two great chances. First Willie Gibson brilliantly beat two defenders, broke into the box, shot with only keeper Danny Rogers to beat —missed. The Grant Gallagher beat the ex-Sons keeper but his shot went over the bar. Bob McHugh made it three for ex-Sons player Peter Houston's team just before the interval. There was to be no Sons comeback after the break. Baird completed his hat-trick with a goal almost identical to his first two, then Blair Alston made it 5-0 as he drove home unmarked from the far post. The home side should have had a penalty when Luke Leahy hauled down Grant Gallagher in the box (pictured), but a possibly unsighted ref Willie Collum — well behind the play — awarded only a corner kick.